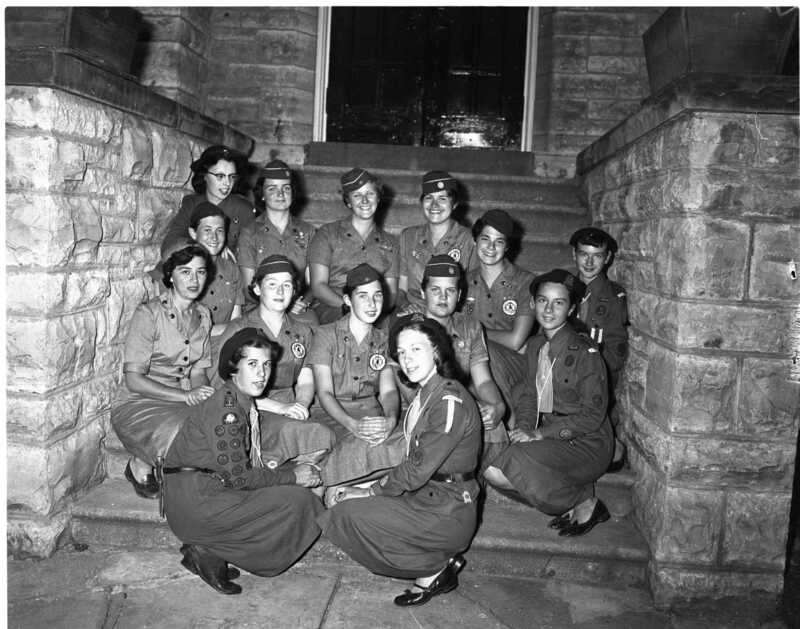 Stopping off on their way to a world encampment of Girl Guides at Doe Lake Camp, Huntsville, was this group of American guides from New York City and Long Island NY. Front row; Marion Lavigne and Karen Wood, Midland. Second row; Camille Guiliani (leader of the U.S. party), Jean Boyle, Joyce Malakoff, Nancy Walsh and Patsy Scharbach of Midland. Third row; Nancy Scharbach, Midland; Ann Smith, Eileen Anderson, Barbara Banks, Ruth Sanches, Eleanor Browner, Doreen Moreau of Midland. The girls enjoyed boat trips, visits to historical locations and picnics at Little Lake Park while here. 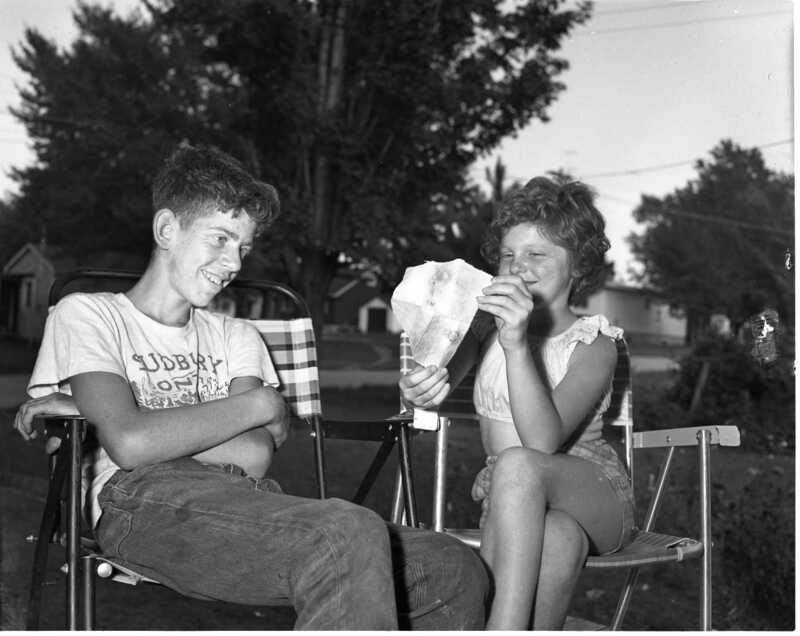 Aug. 7, 1957. Dear Sir: Enclosed find a note that I discovered in a bottle on my beach at my summer home, Honey Harbour, Mermaid Island, last week, just before returning home. It may be of interest to some families in Midland. Rev. John M. Strodel Buffalo, New York. 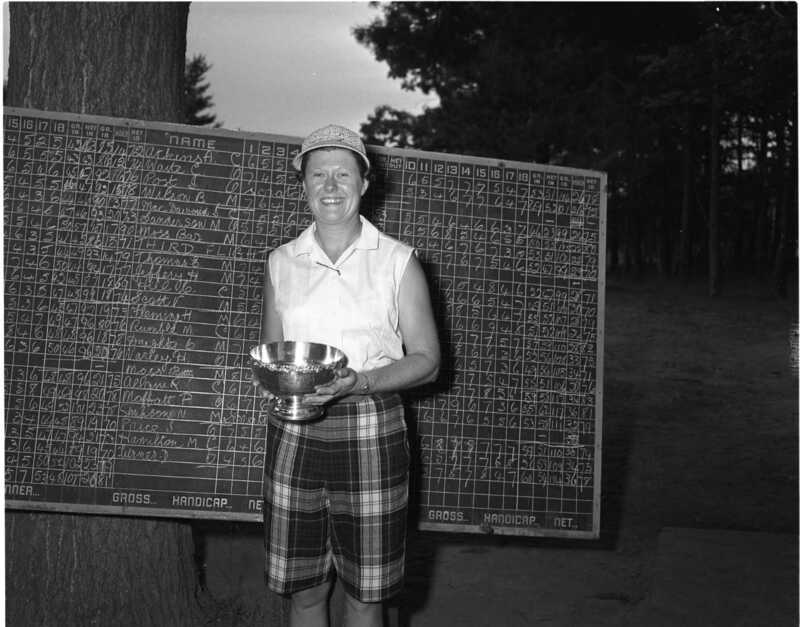 Miss Jean Wallace is the first woman to win the Simcoe County women’s golf title since 1950 and is seen above with her trophy at the Midland Golf & Country Club. Shooting rounds of 82, 84 and 85, Miss Wallace’s total of 251 was two strokes better than her nearest rival, Mrs. Betty Robinson of Collingwood. Penetang firemen had a four-hour battle on their hands when they were’called out about 5 a.m. Sunday to extinguish a blaze in Chas. Scott’s barn. The fire was first discovered by Mrs. Peter Marchand, who heard the “crackling sound of flames”. She called to her son, Leon, who turned in the alarm. The barn contained a large quantity of hay and straw, as well as approximately 2,000 bushels of oats which had just been threshed recently. No estimate of the loss is available at present. The loss is partially covered by insurance. Greatest “worry of firemen was that the flames might spread to nearby wood and sawdust piles, or to the new arena. 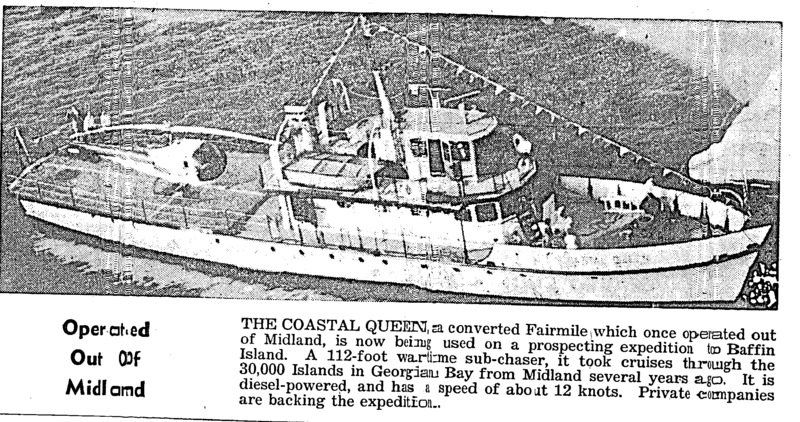 We could find no record of this Fairmile, Q089 built at Creavettes in 1942, as a local cruise ship. Here sister Q088 built in Toronto was the Penetang Eighty-Eight or Midland Penetang Eighty-Eight of local fame. Bob Gilles, son of Midland banker R. G. Gilles was the pilot of the helicopter on this northern expedition. 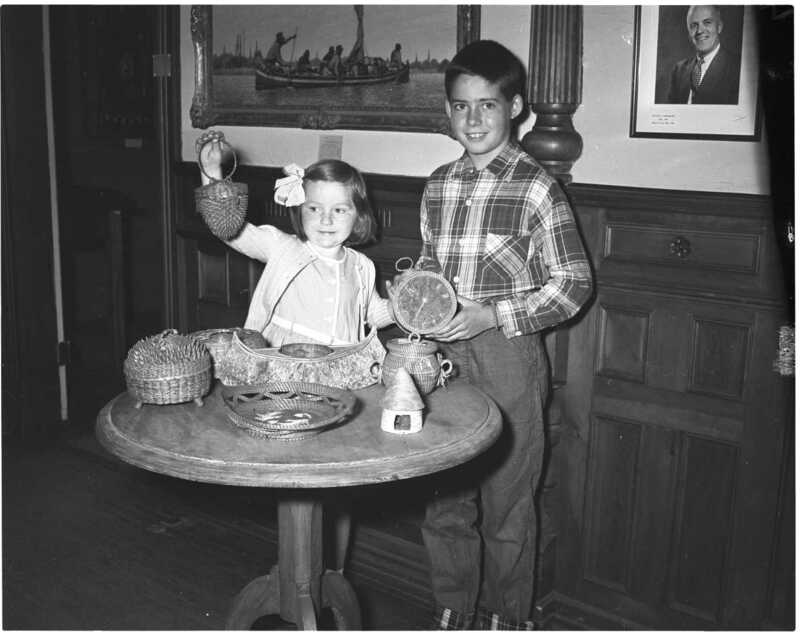 Many examples of early native handicrafts were recently donated to Huronia Museum by Miss Riddell of Toronto and Go-Home-Bay. Many of them were obtained by her late father, a sea captain. Getting a close look are Jane Upper, daughter of Mr. & Mrs. C. Upper, Grimsby and John Cranston of Midland. The headline, Midland Free Press August 28, 1957; Lake Shipping Grain Slump Causes Early Layoffs For Local Tars [tar is an informal name for a seaman] The slump in Great Lakes grain shipments, attributed to the 723,000,000 bushel glut on the market, has hit North Simcoe district sailors, a National Employment Service official told this newspaper yesterday that approximately 22 local sailors are affected by the grain situation. He said the group represents about five per cent of the total registered mariners at the NES Midland office. 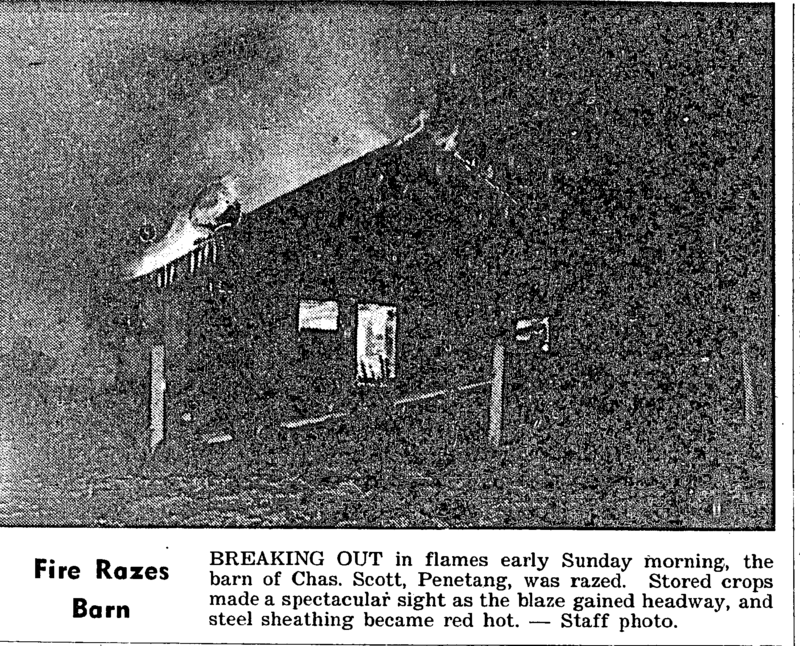 The headline, County Herald August 30, 1957; Near Beer Consumption Rapped by Cadi In Penetang Case. Magistrate Kenneth A. Cameron indicated in Penetang court yesterday he would not differentiate between the controversial beverage “near beer”, and the regular product as far as minors are concerned. Asking that the press take particular note of his stand on the matter, the magistrate said: “It is my understanding that ‘near beer’ is an alcoholic beverage within the meaning of the act, and that will be the attitude of this court. There are still some honest people in the world, according to Penetang Police, who had a concrete example last week. According to Sgt. L. Robillard, a Barrie salesman came into the office carrying a bank deposit bag which apparently contained a fair sum of money. He explained that he had found it between his car and one parked alongside. Police found the owner of the bag, a Penetang business concern, and returned it before the firm had time to report the loss. Students at Midland-Penetang District High School copped three out of four Dominion-Provincial Bursaries allotted to Grade 13 graduates in Simcoe County. Winners of the three top bursaries of $500 each are Myrna Bannon of Vasey, Jeanne Sauvé of Penetang and Joe Tersigni of Port McNicoll. The bursaries are awarded on the basis of scholastic ability. 25 Years Ago This Week – A sack containing a number of bones wrapped in a baby’s dress was found at the roadside of W. Forget’s farm. Chief Wm. MacDonald and Prov. Const. Robert Beatty investigated and found that it only contained fish bones. * * * The boat “Vigilants” moored at Penetang Bay for two years burned at her moorings. The remains were towed to the North West Basin to be beached. * * * The Q. S. McFarland and the Emperor unloaded a total of 575,000 bushels of grain at Midland elevators. * * * Tay Council had to pay approximately $62 to sheep owners in the district to recompense them for animals killed or hurt by dogs. * * * Judge C. W. Holtcamp (sp) of Probate Court, City of St. Louis, spoke at the luncheon meeting of the Kiwanis Club. His subject was “the question of confidence as related to the existing depression.” * * * Thomas Lambert Chew, pioneer lumberman and well-known in Simcoe County, died August 15. 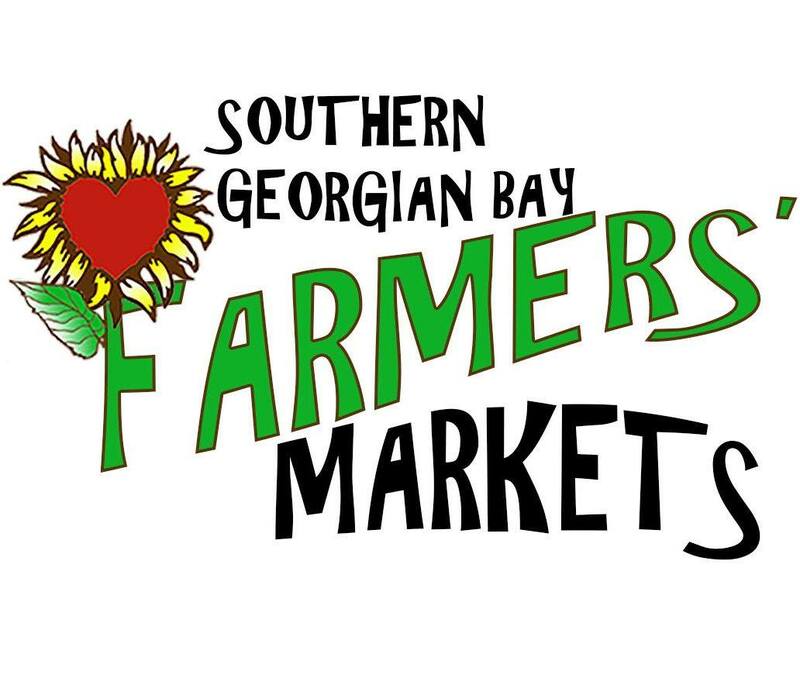 * * * A big tourist parade was scheduled for August 2. 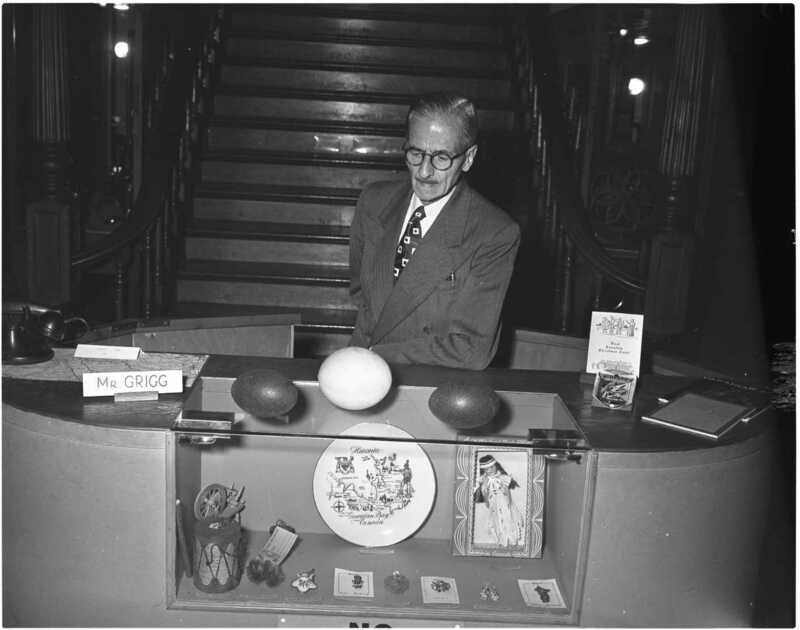 Prizes were offered for best entries. * * * The firemen’s tournament was held at Elmvale with teams from Midland, Penetang, Coldwater, Elmvale, Orillia and Barrie competing. * * * Clarke Edwards was the instructor at the playground activities in Port McNicoll under the CPR recreation club. Orland French, 13, of Waverley, is getting good results from his summer agricultural project for the Midland-Penetang District High School. The chickens he has been caring for only started laying on August 17, and have already produced three double-yolk eggs and one triple-yolk egg. It was a four and a half-month-old pullet who produced the triple-yolk egg. His birds are a cross between the White Wyandotte and the Rhode Island Red. Orland will enter Grade 10 at MPDHS this fall. Arthur Wright, 52, of William Street, Midland, plunged 40 feet to his death Wednesday afternoon at the Dorr-Oliver-Long plant in Orillia, where he was employed as a crane operator. Mr. Wright was killed instantly when he fell headfirst to a concrete floor from the cab of the crane he operates in the plate shop of Orillia’s largest industrial plant. He was preparing to start the night shift and had climbed a vertical ladder on the wall to the catwalk on top of the crane. There he threw the main switch and descended into the cab. Seconds later his body came hurtling down to the floor. Crackling noise of flames around midnight, Tuesday, woke Wilfred Piitz in his Lafontaine home and likely saved the lives of Mr. and Mrs. Piitz and their children. Mr. Piitz was apparently sleeping upstairs in the house, along with two children whom he grabbed when he realized the building was on fire. Rushing downstairs, he roused his wife and the family made their way to a next door neighbour where they were able to turn in an alarm. By that time flames were bursting through the roof of the building. A resident of Penetang all her life, Mrs. Isidore Le Page died Aug. 19 at Penetang. Funeral service was held from the home of Mrs. John Smith, Aug. 23. Interment was at St. Anne’s Cemetery, Penetang. Rev. Leo Rausperger officiated and the pallbearers were six grandsons; John Le Page Jr., Isidore Le Page, Henry Le Page, Clement Le Page, Wilfred Le Page and Clement Contois. Mrs. Le Page, the former Suzanna Trudeau, was born and educated in Penetang. She lived there all her life and in 1889 she married Isidore Le Page. A member of the Roman Catholic Church, Mrs. Le Page belonged to St. Anne’s’ Society. Predeceased by her husband July 1, 1929, Mrs. Le Page is survived by sons John of Penetang, Peter of Pine Portage, Anthony of Midland, Joseph of Midland and Isidore of Montreal, two daughters, Cecelia Irwin of Toronto and Alida Gartner of Toronto. Also surviving are one sister, Emma Carriere of Toronto, 33 grandchildren, 65 great-grandchildren and 4 great-great-grandchildren. Dean Martin is starring in “Ten Thousand Bedrooms” at the Roxy.